This recipe originally appeared on the Dish Magazine website. You can find more of my recipes HERE. We’re heading into a long weekend here in NZ and I couldn’t be happier. I’m going to get into my garden and sort out all my summer vegetables. 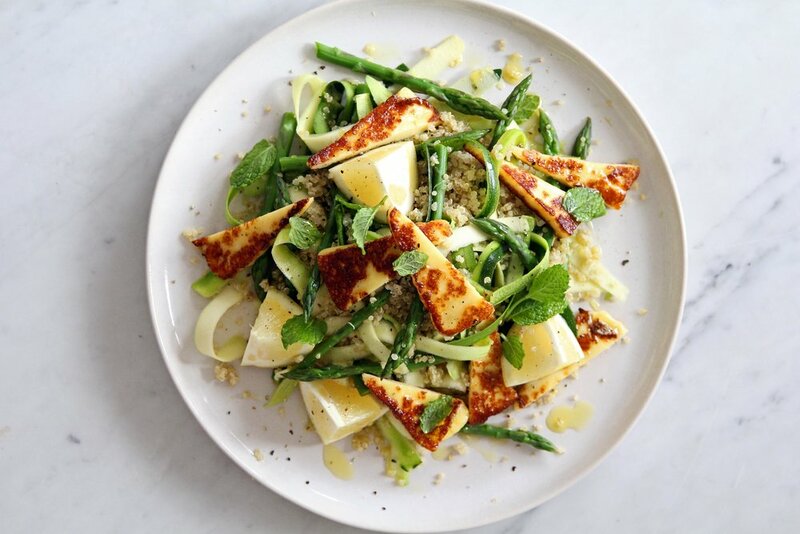 Asparagus, zucchini ribbon, halloumi & quinoa salad. Place the quinoa and stock in a medium saucepan and bring to a boil. Reduce to a simmer and cook, with the lid slightly ajar, for 15 minutes. All the liquid should be absorbed. Remove from the heat and place the lid on tightly for 5 minutes before fluffing with a fork. Set aside to cool completely before using in the salad. Bring another saucepan of water to a boil. Add the asparagus and cook for 2 minutes before draining and cooling rapidly under cold water. This will keep the asparagus crisp and bright green. Lay on a tea towel to remove the excess liquid. Use a vegetable peeler to create ribbons with the zucchini. Work your way around the outside of the vegetable, stoping when you reach the seedy core. Place all the dressing ingredients into a jar and shake well to combine. Season to taste. Wait until you are ready to serve before cooking the cheese. It is best when piping hot. Cut the cheese into 1cm slices. Heat a sauté pan over a medium high heat and add a generous glug of oil. Cook the cheese for 1-2 minutes on each side until golden brown. Slice each piece diagonally when cooked. To assemble: Toss the quinoa, zucchini, asparagus and mint together in a large bowl. Add 1/2 the dressing just before serving, along with sea salt and cracked black pepper. Mix through. Spoon onto a large platter. Drizzle with additional dressing as desired. Top with the hot halloumi and extra fresh mint leaves to garnish. A generous grind of cracked black pepper looks nice on top.